I went from a BBQ Restaurant (smoked pork, brisket, chicken, salmon, ribs, polish sausage, etc.) owner to a Vegan! A lot of people can’t believe it when I say that. One of the most common questions that I get is, “Are you getting enough protein?” That question honestly makes me want to roll my eyes and walk away. But I get it. We have been trained most of our lives that meat and dairy is essential for protein and to build strong muscles. The USDA Food Pyramid is a prime example of that. What most people don’t know is that a Vegan diet has a ton of protein in it! I get more protein now than I did eating meat and dairy. The protein sources that I consume does not have cholesterol, unhealthy fats, casein, hormones, or antibiotics in them. -Primates are the most closely related mammals to humans. -A Male Gorilla is 300 to 400 pounds full grown. Females are 150 to 250 pounds. -Gorillas are incredibly lean and strong. -A Gorilla consumes around 40 pounds of vegetation and fruits daily. -Gorillas occasionally eat ants, termites, and termite larvae. 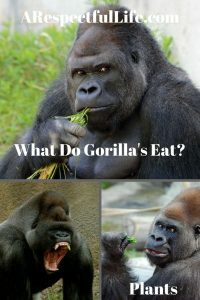 Are any gorillas obese? Do any of them eat meat? None eat meat, they are herbivores. In the wild, they don’t develop obesity, diabetes, or heart disease. Humans on the other hand, and especially Americans have an alarming rate of obesity, heart disease, inflammatory conditions, and chronic diseases. The biggest difference between humans and apes is that we have a starch digesting enzyme and require more starches like potatoes, rice, and grain. The other difference is that apes do eat occasionally eat ants, termites, and termite larvae. It is thought that this is where they get their Vitamin b12. They will also very rarely eat soil if they need more minerals than they are getting from the current vegetation that is available. The only nutrients that humans require that they cannot get from plants is Vitamin B12 and Vitamin D. Vitamin D comes from the sun (or a supplement if you don’t get out much!). Vitamin B12 comes from bacterial fermentation and some animals (like cows) ferment in their gut. Humans do not and Vitamin B12 is essential to our well-being. A Vitamin B12 deficiency leads to anemia and nerve damage and both of those are dangerous health conditions. One thing that a Vegan need to be cautious of more than anything is to ensure they are getting enough Vitamin B12. There is currently nothing in nature that science has discovered, besides animal products like meat and dairy, that provides Vitamin B12 for the Vegan Diet. It is, therefore essential that a Vegan person takes a Vitamin B12 (or B Complex) supplement, of B Vitamin fortified products like some cereal. There is one primate that needs to be mentioned here and that is the chimpanzee. Scientifically, chimpanzees are the MOST closely related to humans. We share around 98% of their DNA. Chimpanzees are opportunistic eaters. They consume the flesh of other vertebrae animals approximately 9 days per year and it accounts for around 2% of their overall diet. I mention this only because it is a fact and I am sure someone will bring it up. However, if given the choice, chimpanzees prefer figs and fruit. They will eat to survive no matter what. It is important to note that gorilla’s and chimpanzee’s habitat is tropical or subtropical. These regions experience changing weather conditions and drought which sometimes makes the typical diet of these primates scarce. These animals are also only capable of traveling less than a mile per day to forage for their food source. Because chimps sometimes eat flesh does not mean that humans should or need to consume animal based products. We are a more intelligent primate than are chimpanzees or gorillas. (Even though we are crazy, can never agree, start wars, kill each other, and ruin our environment!). We do have scientists and can and do develop appropriate supplements to benefit our health. We can test our foods to find out what is in them. We know what plants, fruits, nuts, seeds, etc. have the nutrients that we need. You don’t have to believe me as the science and research is available. Do the research yourself. A plant based diet is best for your health and best for our planet. Previous ArticlePrevious Post: Suffering From Inflammation? Next ArticleNext Article: Are You Getting Enough B12? I found you via a Yahoo search and am glad I did! Your posts are well thought out and researched. I am subscribing and look forward to more. Very nice post. I just stumbled upon your blog and wanted to mention that I’ve really enjoyed browsing your blog posts. I’ll be subscribing and I am hoping you write more very soon! Thanks Theresa! Appreciate the feedback. Will post more soon.